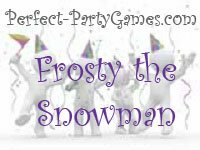 Summary: Frosty the Snowman is a game where you wrap a player in toilet paper and then decorate them as a snowman. Choose someone to be the final judge before the game begins. The judge may not help decorate Frosty. Have one player per team stand in the middle of the other players. The team members get to then start wrapping the "Snowman" with the toilet paper until all body parts are covered. When finished wrapping with toilet paper, the team can now use the construction paper to decorate or "dress" Frosty anyway they deisre. The judge chooses the winner.